Young adults, defined as individuals aged 18 to 25, represent around 10 per cent of the UK population but account for a third of those sentenced to prison and 30-40 per cent of cases involving police time each year. There is a growing body of research which shows that many young adults have not yet reached the full maturity of adults, which can lead them to engage in risky behaviours. This has led many to argue for a distinct approach to this age group that is carried across all agencies of the criminal justice system. 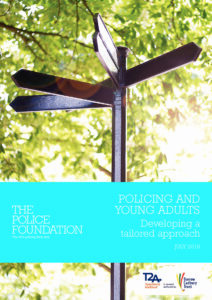 This report describes the current approach in policing and argues that there is a case for taking a tailored approach to the 18 to 25 age group. The report sets out what such an approach might look like and proposes to test these ideas in police forces in England and Wales. Have police cuts contributed to the increase in violent crime? A ‘sexting surge’ or a conceptual muddle?